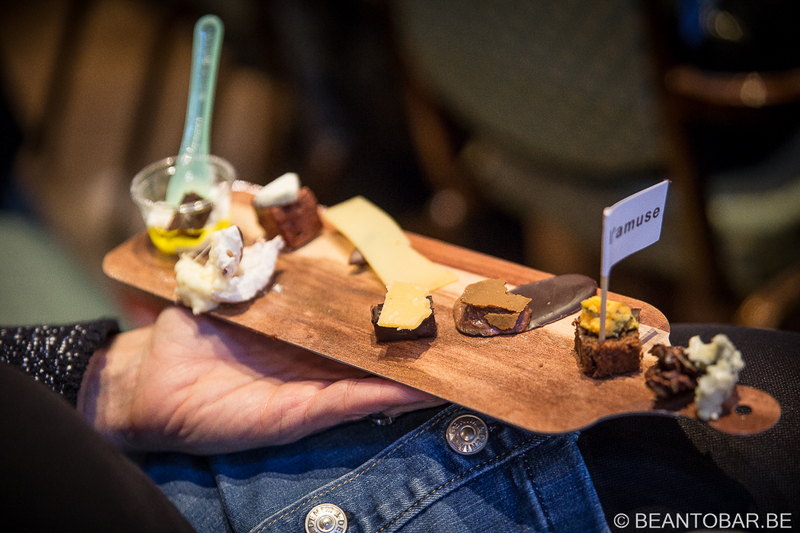 Every year, Amsterdam become the fine chocolate hotspot for one day. In October the Origin Chocolate Event is held in the wonderful setting of the tropical institute. Its colonial architecture creates a stunning backdrop for a gathering of chocolate makers, chocolate sellers and chocolate lovers. In the central marble hall, 18 companies present their products. It is always great to search around for new bars and meet the faces behind the webshops and brands. 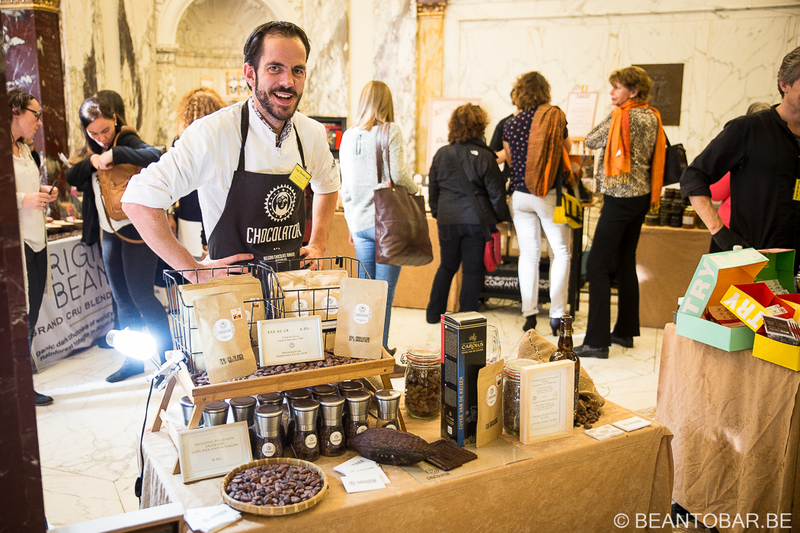 I was more than proud to see Chocolatoa, the first Belgian bean-to-bar chocolate maker representing himself at the event. Mario Vandeneede was out on his Madagascar bars and nearly all his award winning Costa Rica bars as well. 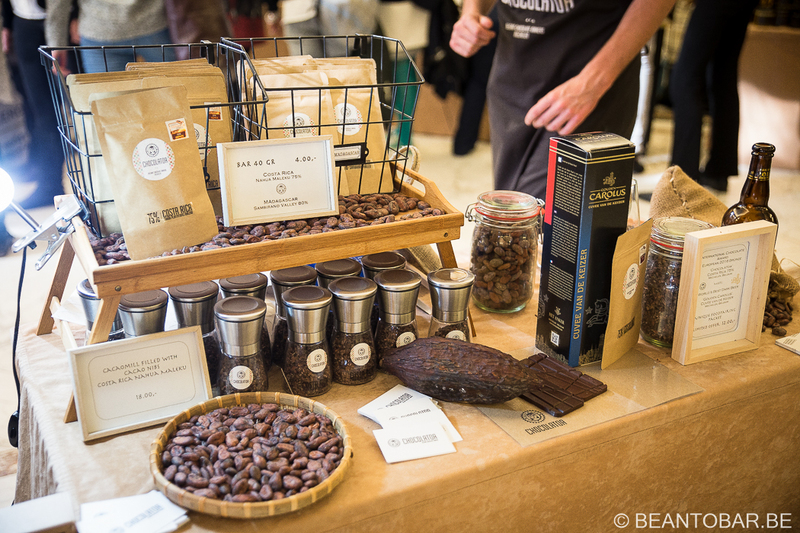 Other brands like Original Beans and El Rey attracted a lot of attention. Pro Ecuador displayed an ever growing range of bars made in their chocolate rich country. To bad I couldn’t purchase some of the bars I can’t get my hands on yet. Other stands offered a wide variety of chocolate brands and origins, to many to name them all I’m afraid. During the event, 7 presentations are given in the Speakers Hall. Combine this with 4 tasting rooms, hosting 7 tasting sessions per room and you will understand it is impossible to be everywhere at once. You have to choose from the program and the tastings. One tasting can be choosen from the free session and some are paid. But the choise is massive. So here is a little overview on what I choose. 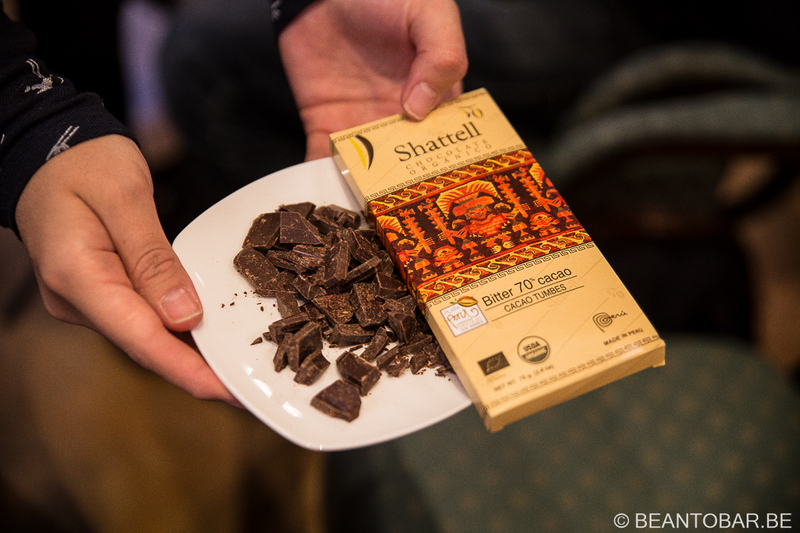 Lisi Montoya from Shattell Chocolate informed us on the amazing array of fine cocoa produced in Peru. 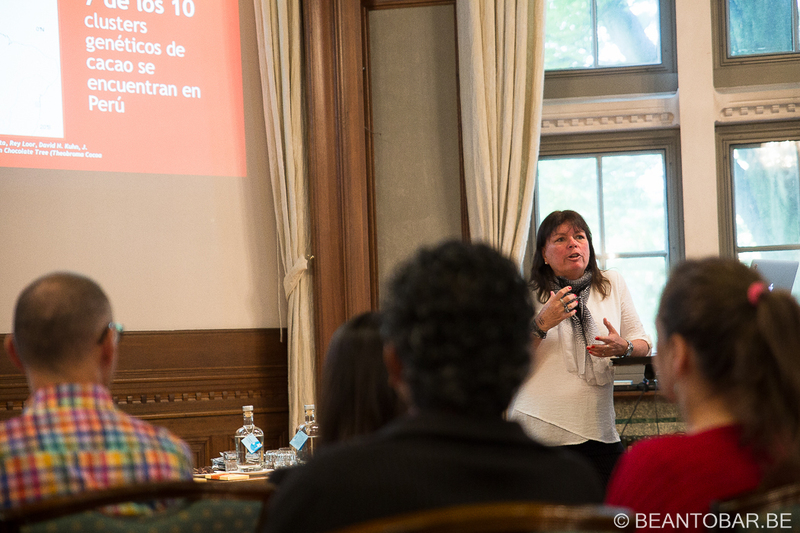 She took us through the chocolate making process and her specific vision on chocolate. Lisi switched trades to chocolate making 7 years ago and had to build up het company from nothing. She only goes for the best quality cocoa, doesn’t use anything but cocoa and sugar in her products and keeps shocking the chocolate world by skipping the conching step in her production. Conching is used to get rid of unwanted flavours, she explained. When the cocoa is top quality, there are no unwanted flavors, so why conch? Proof is in the pudding as they say, so next she offered us samples of 6 different regions, all Peruvian. Her Tumbes 70% bar shines with vibrant dried fruits (plums, raisin, apricot), the Chuncho 70% bar offered a darker, earthy and woddy profile. Even her 100% bar is of great quality, yet not for the faint of heart, as its intense notes are far from any classic industrial chocolate. Orinal Beans has a wide array of chocolates available. They show consistant high quality and were reviewed on beantobar.be before. 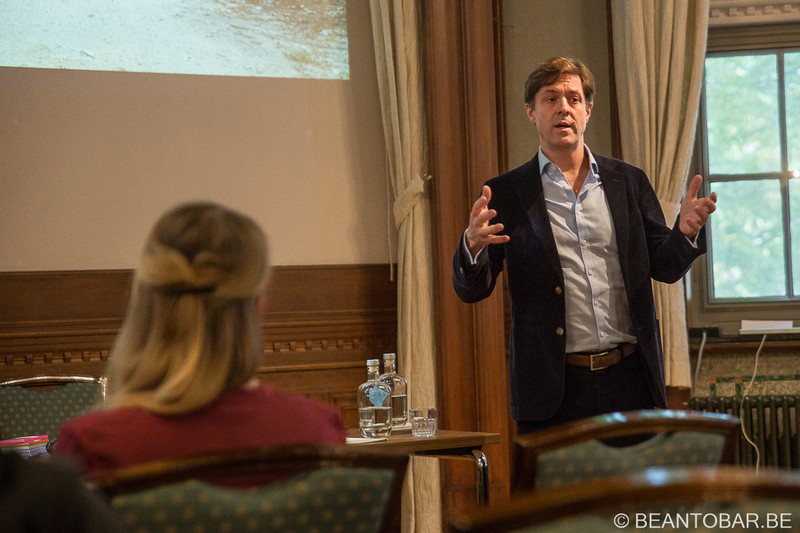 But this time I had the opportunity to hear Philipp Kauffmann explain the distinct vision of the company on sustainable and eco-friendly production of their chocolate. This idea is embedded all through the chocolate chain. Starting from working together with the farmers in order to create multiculture plantations, achieving organic certification, over reducing the CO2 footprint of the production, to creating flavourfull chocolate bars with rare cocoa varieties. During the presentation, several bars were distributed for sampling. The Papua Kerafat 68% bar showed no sign of acidity, but caramel, banana and a slight touch of smoke. The one following was the illusive 100% bar. Made with Cusco Chuncho cocoa, being an Peruvian origin. It is less aggressive than others, due to the fact the cocoa bean variety was carefully selected to create a 100% bar. Opposed to just making a high percentage bar with a choosen cocoa. 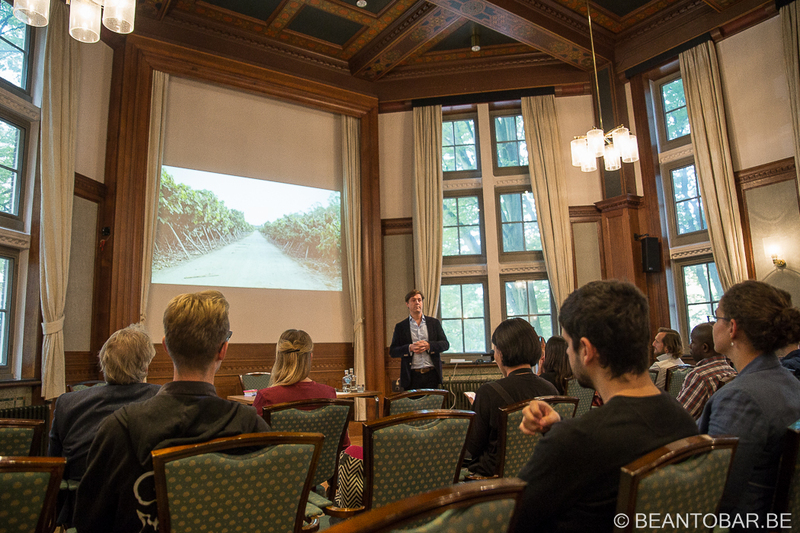 Philipp showed how making chocolate this way can affect biodiversity, CO2 emmissions and poverty in a possitive way. Mariana de la Rosa of El Rey was so kind as to invite me to her tasting session. 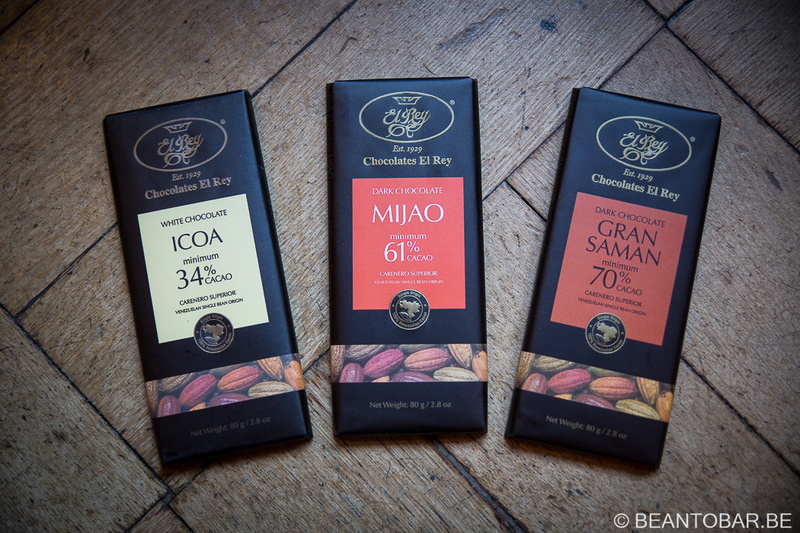 El Rey is a Venezuelan chocolate company which has a long history of chocolate making. The producers was also one of the very first to introduce origin names to its bars, starting a major revolution in the chocolate world. Up until today, the products of El Rey are mainly distributed in South America, North America and Japan. But as El Rey now starts introducing their creations in Europe as well, the Origin Chocolate Event is the perfect place to introduce them to the public. 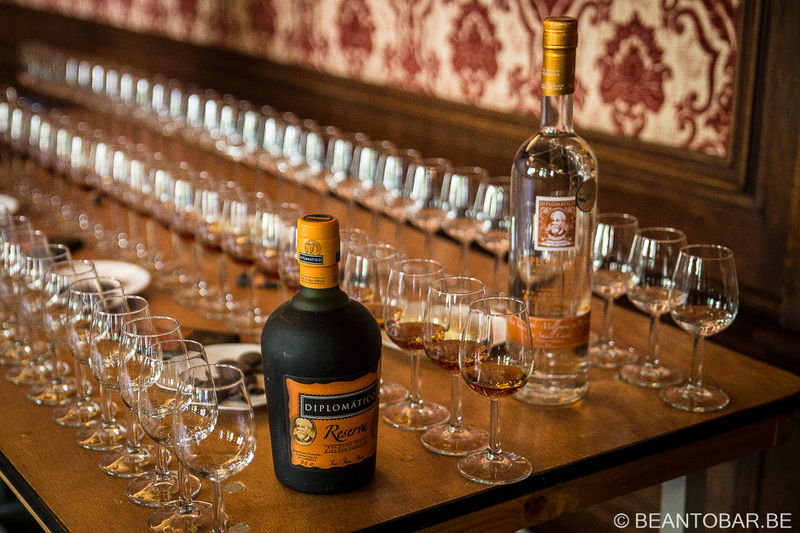 Teaming with Diplomatico rum, a special tasting session of two pristene Venezuelan products was organised. All chocolates were made with Carenero Superior cocoa. First, the 5 times awarde white chocolate Icoa 34% was paired with the Blanco rum. The white chocolate, made with non-deodorised cocoa butter – brings smooth caramel notes in a surprisingly unsweet product. It blends seemless with the gentle nature of the blanco rum with its soft apricot and vanilla touches. The second combination was the Mijao 61% bar with the Reserva rum. The rich chocolate slowly releases its flavors – plum, raisin and dried fruits. Combine this with the dried, more wood flavored rum with vanilla notes and the fruits of the chocolate are strenghtened. Pairing the two products brings out a final result with a very different profile than the two separated. Very nice. Finally, 70% Gran Saman was paired with the Diplomatico Gran Reserva. The powerful chocolate offered earthy notes, wood, red fruits and a roasted end flavor. The rum was sweeter than the Reserva, full bodied and showed notes of honey and vanilla. The rum tempered the darker chocolate flavors and made for a very harmonious taste experience. Merely 5 minutes after ending chocolate/rum session, Chris Brennan started his tasting in a perfectly relaxed English manner. 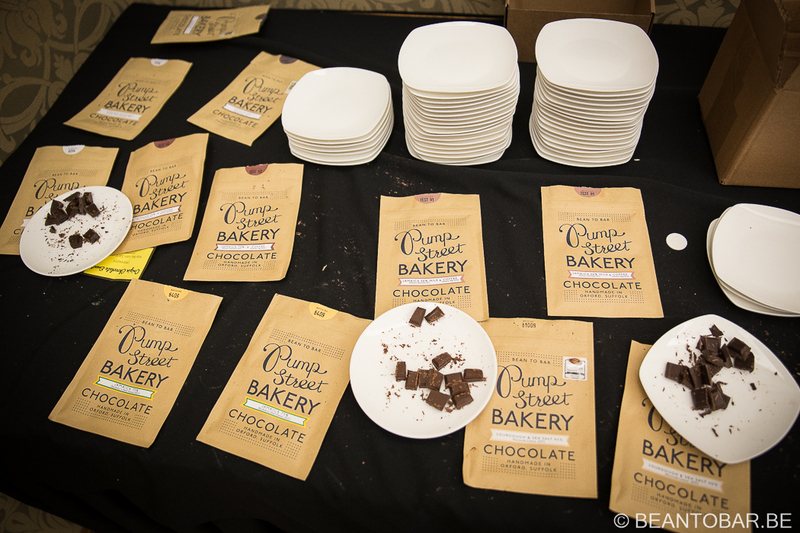 I’ve experienced the products from Pump Street Bakery before and was surprised, but what Chris had up his sleeve today was simply breathtaking. No less than 6 different bars were sampled. Starting with an 85% Ecuador bar – smooth, dark, nuts, coffee and an extremly long aftertaste. Next Chris explained how he tries to blend in new flavors in the bar without pushing away the delicate notes of the chocolate. The same 85% Ecuador bar returned, but this time with sourdogh and seasalt inclusions. This post is to short to go into the details, but it is clear Pump Street Bakery doesn’t simply throw chunks of the dough in the chocolate. It involes roasting the sourdouhg, grinding it, roasting it again, adding it into the chocolate making process. The end result, the notes of the original bar + a great roasted bread note and a flash of salt at the end of the melt and a crunch to die for. The 75% Jamaica bar Chris popped up was of equal quality. The story on how he finally could make a decent Jamaica bar can only be told by him to do it any justice. Let’s just say it took a lot of effort! The flavor? Rum/raising, fruity and nicely chocolaty. Jamaican flavors in a chocolate! Now how can you add to that? 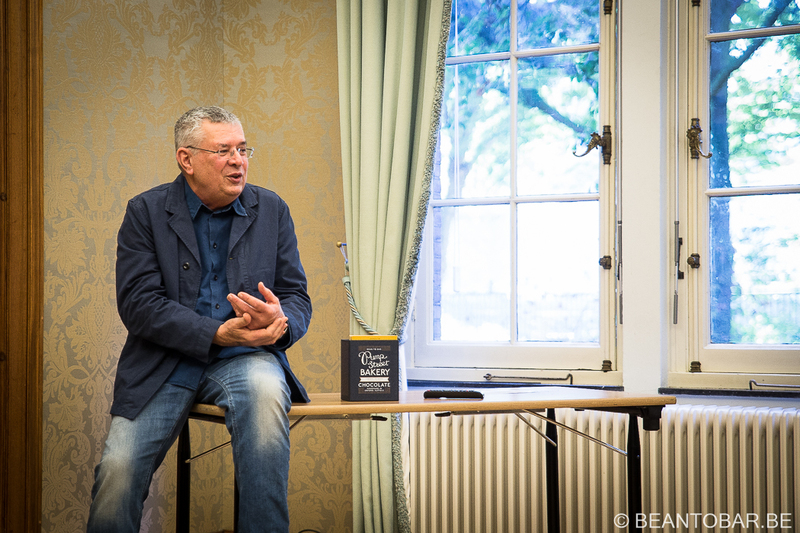 Chris once more started a long story on how he go the ideas for his next creation, not yet on the market. Chocolate + coffee. But once again, not just by throwing coffee essence or pieces of coffee in the chocolate. No. Pump Street Bakery starts with the full cocoa and coffee beans and goes of grinding them together. Marriaged like this, they make for a stunning flavored bar. The Espresso style bar has a flavor that reminds me of fresh ground quality coffee. Instant expresso, without overpowering the sweet notes of the Jamaican bar. The latte version was a milk chocolate made with the same ingredients as the Espresso bar, creating a very enjoyable coffee and milk experience at first, but gliding to the flavor of the expresso bar in the end. It was clear the audience prefered the espresso version. Big compliment to Chris came by a guy from Seattle in he public, stating he was the only person from his city who isn’t permanently attached to a cup of coffee – but the bar was exactly what he would expect from coffee and would be his to go choice. As a final bar, we got another not yet released bar from ecuadorian origin. Part of a special wildelife project, Chris’s contact in Ecuador found a very special cocoa deep withing the jungle. The result is a 77% bar with sweet plum, honey and a touch of liquorice. Whenever you have the chance, you should really check Pump Street Bakery out. They will not dissapoint you. 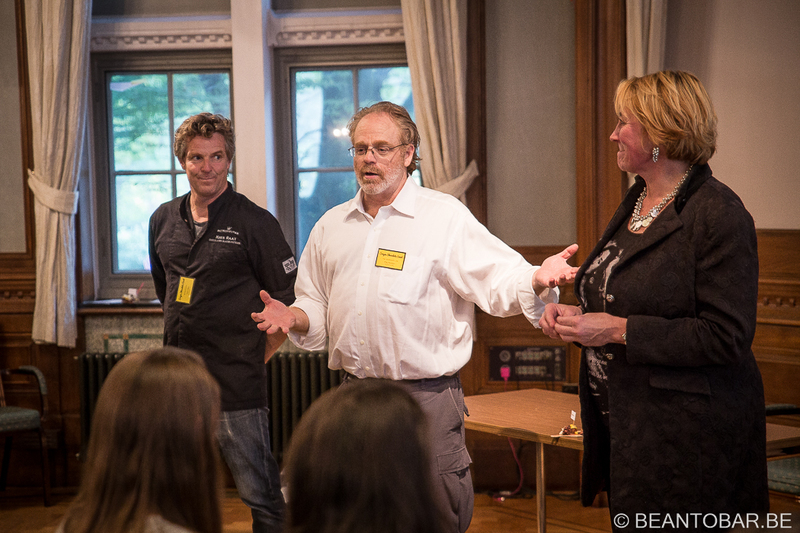 At the end of the day, Clay Gordon teamed up with Kees Raat (A Ducth bean to bar chocolate maker and dessert specialist) and Betty Koster of l’Amuse cheeses. These three specalists threw their heads together to create a special and funky final tasting. On the menue? Chocolate and cheese. Not the most straightworward combination, but one that can work – as shown by hundreds of regional traditions of putting sweet products on salty cheeses. And when we say cheese, we don’t mean ordinary cheese. But Cheese with a capital C. L’Amuse offered us some prime examples of how special a high quality, perfectly matured to enhance the flavors or even given an in house treatment. The chocolate part often provided a great texture contrast. It would take me to long to explain all the combinations, but there was a special mozarella type cheese with a fruity olive oil – combined with a chipotle ganache. A truffle brie combined with a chocolate meringue (what a flavor and texture explosion), a long matured gryere combined with preserved lemonskin enrobed with chocolate (creating new flavors combined) and two amazing blue cheese – an English Shropshire Blue combined with a wallnut brownie and an exquisit Roquefort Caves Baragnaudes on top of a rice and corn crisp enrobed in dark chocolate. Both had a really salty, creamy, flavorful cheese combined with the nice texture and flavor of the opposite sweet part. I have to admitt that by the end of the day my palate was pretty much exhausted from all the tastings, but the cheeses opened my tastebuds open again so it was easy to appreciate this funky experiment. A big thanks to Clay, Kees and Betty for this finale and a renewed excitement for a top of the line product, being cheese. The day litarilly flew by. 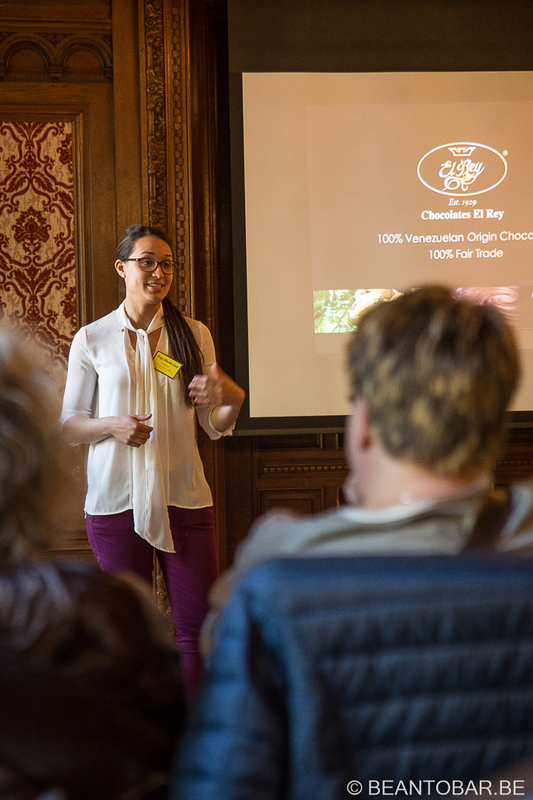 Wandering from presentation to tasting, over meeting chocolate makers and fellow enthousiasts, The Origin Chocolate Event remains a great way to deepen your knowledge on single origin and bean to bar chocolate. It shows more and more people are showing an interest in the product chocolate and start to understand it can be very different from the product we all know since our childhood. Seeing new names and people emerge on the scene further strenghtens this feeling. When you visit consecutive years, you will notice some brands and names keep coming back. But there are always enough new products and chocolate makers present to keep things interesting. I was a bit surprised the number of free tastings was reduced to one this year, making the choice even harder. 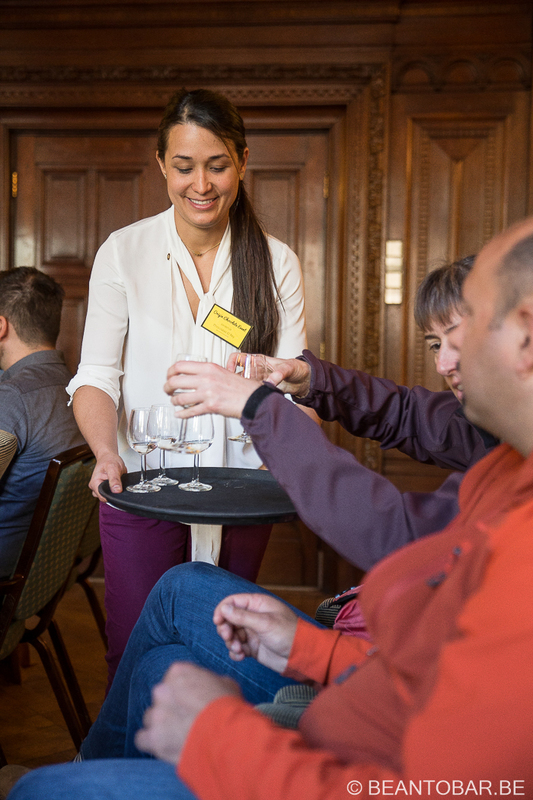 Adding extra paid tastings is also something new and I do have mixed feelings about this. But what a fun day it was. Looking back, you can’t help feeling you might have missed out on other spectaculare tastings or interesting meet&greets. I would have loved to join the Friss Holm session or the pairing of bio wines with chocolate by Isabel Quireynen (Bitterzoetchocolade.be – soon launching a bean to bar range of her own). And so many others. Makes me wonder who will be attending next year. I can’t wait.